In Firefox, I occasionally need to clear my cache to fix a website. But clearing the entire cache seems like extreme overkill. Is there any way to just clear the one site from my cache? Note: This will clear saved passwords for the site as well. If you want to do a force-refresh, which is what I think you want to do, hit CTRL+F5. And of course, Cmd+F5 on a Mac. Works on Chrome too. Please note that there is currently no way to clear cached HTTP redirects (at least 301 type) without using a plugin. Ctrl+F5 / Cmd+F5 does not work as you are being immediately redirected to the target URL so you can not refresh the original one. So I used CacheViewer plugin mentioned here before to deal with this. See also this bug in Firefox for details and possible progress on this issue. There is no built in way to clear the cache of specific pages/sites in Firefox. 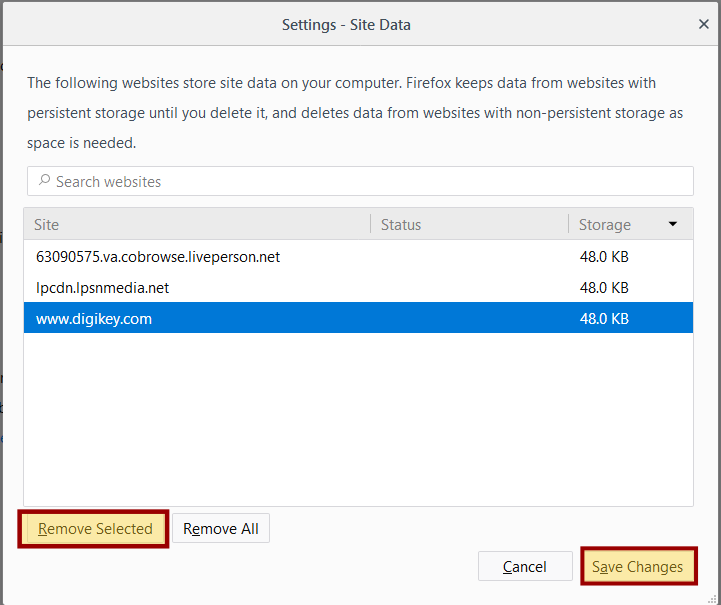 You can "Forget about this site" which cleans the domain from history, you can "Delete this page" which cleans the specific page from history, but you can't clean up single cache items belonging to a page (apart from going to your profile folder and deleting them). There may be addons to do this, but I didn't find anything when looking through them. Built-In functionality for cache deletion seems to have the all-or-nothing policy. One day when you have not opened anything else, go to Tools ⇨ Clear recent history and then select to only clear the cache and then only from today or Xtime. Because you just visited the website, it should have moved its timestamps in the cache to the top of the list so you can just wipe all cache from Firefox for that day and thus clear the cache for your specific website. 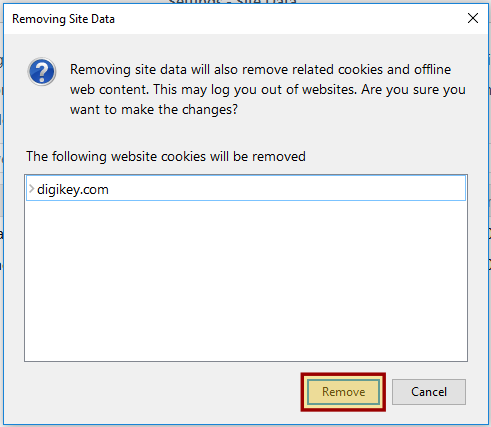 In what seems to be a just released Firefox extension, the original question now has an answer which is both a direct solution to the problem posed (not how to also remove cookies, passwords, etc from the selected domain which happens through the use of "Forget about this site") and will handle websites which utilise a page redirect rather than a page content change that is undesirably cached. Great design also. Quick and efficient. I'm kinda late to the party here, but I wanted to leave this answer for people who found this thread through googling like I did. The problem was solved for me by accessing Firefox's profile selector (Windows -> Run -> "Firefox.exe -p"), using a new profile and visiting the website from there. Then when I went back to my regular profile, the website began working normally again! Opening it on the other profile must have refreshed my regular profile's cache with non-corrupt versions of the files. You can use Firefox by 2 profiles. There's a extension named CookieMonster may works for you. There are two add-ons for FF that every web developer needs and they are Web Developer Toolbar and Firebug, the Firebug extension YSlow comes in very handy too. Web Developer Toolbar has great cache and cookie control down to individual cookies. Another approach would be to use Firefox's containers - create a fresh container tab/window using (using a container add-on e.g. Temporary containers, or Mozilla's Multi-account container add-on) and load your site in that container - a fresh/temporary container will have empty login, cache etc so will act like you've cleared these. Simply run the script with each URL that you need to purge (or make up a loop... you know the drill). Theoretically this should clear cached AJAX responses, other asynchronously loaded resources, and 301 redirect entries as well (as long as you enter the original (pre-301) URL). Not the answer you're looking for? Browse other questions tagged firefox browser-cache or ask your own question. Is there a way to selectively clear or delete cache specific to one website or domain in Firefox? How can I clear images from IE cache? How can I force Firefox to revalidate for a specific site? How can I clear Chrome's 70GB cache?